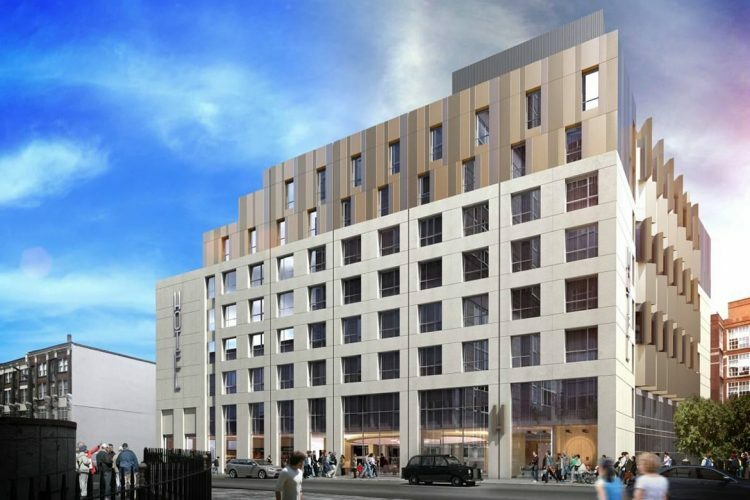 Cristofoli are proud to announce our successful bid in providing a complete facade solution for the new flagship Travelodge Hotel located at Aldgate, Central London. This project will be one of Cristofoli’s largest to date which will encompass a complete solution from design and manufacturing through to installation. Travelodge has recently invested over £125 million into developing 15 new hotels across the country, with 5 alone located in London (www.telegraph.co.uk). Its Aldgate site aims to be the flagship hotel for the brand, with extensive use of stonework throughout its exterior. A project of this size and magnitude will help cement Cristofoli International as a leader in not only providing lightweight natural stone cladding, but as a turnkey facade provider. Combining our already strong experience in design, manufacturing and installation, adding windows and insulation only expands our versatility for future growth. As part of our facade package, we have proposed an innovative method of pre-assembling window frames to metsec sfs frames to be simply picked up and positioned at site. This method will reduce assembly time, lower the chance of onsite complications and overall lessen the impact on site. This will however mean larger premises for Cristofoli International! We’ll be doubling our existing factory space, with complete refurbishment to include two new overhead gantry cranes, modern LED lighting and energy and noise efficient paneling. On-site work will commence in the summer of 2017, so stay tuned for future updates as the year progresses. We’ll be undergoing many changes as we grow for the future!